Floria Duta topped a field of 7,584 entrants in the 2018 GUKPT Goliath to turn £125 into £101,450. 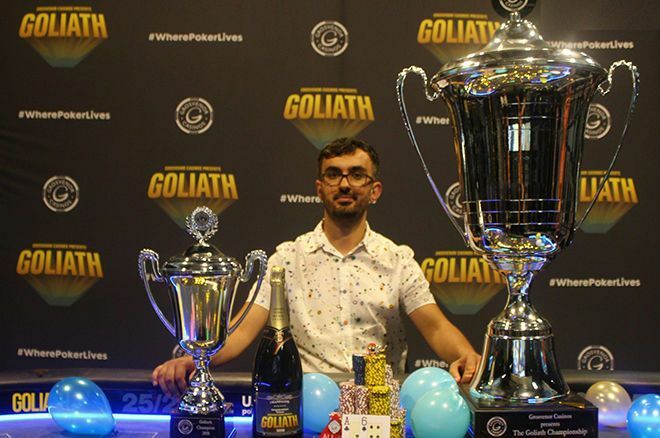 Birmingham-based Romanian Florian Duta is the new GUKPT Goliath champion after he topped a record field of 7,584 players to turn his £125 investment into a massive £101,450. The 2018 GUKPT Goliath broke its own record for the largest poker tournament outside of Las Vegas with a 7,584-strong field. Grosvenor Casinos guaranteed the eventual champion would win at least £100,000 and that’s exactly what happened as Duta walked away with £101,450. Some 747 players received prize money for their efforts. Min-cash was worth £150 with each of the nine players at the final table securing £10,000. Joseph Stoyles busted in ninth-place and netted £10,000 with Gordon Paterson following Stoyles out of the door in eighth-place to win £11,600. Seventh-place and £14050 went to Ioana Belet before Craig Marnier exited in sixth-place for a £17,950 payout. Banking £25,650 for fifth-place was Ricky Read and now the money was getting serious. Bogdan Bolboceanu saw his £125 turn into £37,150 when he fell in fourth-place and Mariusz Czech crashed out in third-place for a £52,500 payday. This left Warwick Brindley and Duta to battle it out heads-up in what was essentially a £28,350 heads-up sit & go. No deal was struck, despite the huge pay jump, and it worked in Duta’s favour as he swept Brindley aside to win his second six-figure score in the space of a month. You can check out the final table action via the video below. This latest victory was Duta’s second in a month after the Romanian won the $1,600 No-Limit Hold’em Championship at the 2018 Wynn Summer Classic in Las Vegas for a career-best $429,161. Duta managed six cashes at the 2018 World Series of Poker, including a 12th place finish in the $3,000 No-Limit Hold’em 6-Handed event. Duta now has $1,248,636 in live poker tournament winnings, enough to place him sixth in Romania’s all-time money listings. He is now less than $200,000 behind Dan Murariu in those charts and if Duta’s form continues, a top five berth beckons. Next up on the 2018 GUKPT is a trip up North to Leeds where a £560 buy-in Main Event with a £100,000 guarantee is the highlight of the festival. GUKPT Leeds runs from Sep. 9-16 at the Grosvenor Casino Westgate. Will Duta be there? You had better hope not!